Despite the slowdown, Korean auto giant – Hyundai shown its commitment to its Indian market by unveiling its mega plans for next year. Hyundai which started shipping out i20 -the punto competetior will launch atleast three models in the small car segment in India over 2009. Here are details on Hyundai’s new small cars for 2009.
i20 is the getz replacement in european markets but in India Hyundai is yet to make headway in the premium small car segment. reason, Getz is totally eclipsed by swift. But soon this might be the thing of past, following the success of i10, i20 is solely made in India and will be exported to countries across the world. i20 is designed at the company’s European design centre at Russelsheim, Germany, and is designed and engineered to meet the European tastes and needs.Hyundai makes i20 in three variants — 1.2 litre, 1.4 litre and 1.6 litre — in both petrol and diesel versions. European styling, powerful engine, impressive cabin space and quality interiors of the new i20 makes us to believe Hyundai has already a winner in its hands. 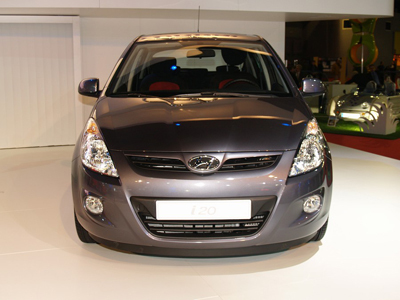 Hyundai will launch the i20 in January 2009. While i10 has been a success story for Hyundai, a diesel would make the car to reach heights. The i10 diesel would come with a 1.1L CRDi engine developing 75PS of peak power at 6000rpm and 155Nm of max torque at 2000rpm. When i10 diesel comes to India, it would take the credit of carrying smallest diesel engine under its hood. 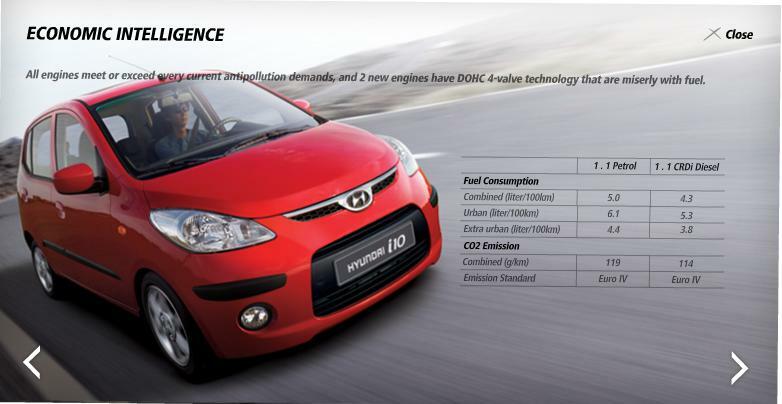 i10 diesel is expected to be a fun to drive machine at the same time offering greater mileage. Going by the success of swift diesel, we expect cutomers to make a beeline in Hyundai’s showrooms. i10 diesel would hit the showrooms in 2009. Though the santro is put to graveyard in the international market after the launch of i10, it continues to enjoy good response from Indian customers. To make it contemporary and to further boost its volumes Hyundai will launch a facelifted santro sometime in 2009. Expect the changes to be cosmetic as Hyundai is aggressively pushing the i10. Ever since the Nano came out, Hyundai has set an eye on this segment. 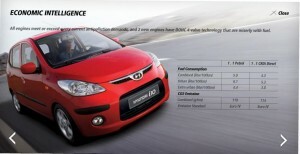 Though Hyundai earlier denied the fact that its low cost car won’t compete with Tata’s Nano. Now it accepts the low cost car would appeal the two-wheeler users aspiring for a car. “We are developing a small car in the entry level range and it should hit the market by 2011,” HMIL Managing Director H S Lheem said. “We have adequate capacity to manufacture (the new car) in the plant. It’s capacity is about 6.5 lakh cars per annum and we are sure that it will accommodate,” Lheem added. Contrary to the expectations, Chevrolet has launched the current aveo U-VA with a minor facelift not the one shown in 2007 Frankfurt motor show. As we reported you in advance, Chevrolet today launched the new Aveo U-VA in India. First shown at 2007 Frankfurt auto show, this new Aveo U-VA will be officially available in India from today. Both internally and externally the new Aveo U-VA offers significant advances over its predecessor. This is a serious facelift and the new Aveo U-VA gets bold styling which imparts its new sporty image. The bonnet follows the lines of the radiator grille. Eye-catching contours, which flow from the bonnet to the A-pillar, highlight the sporty look. The fresh design of the new Aveo U-VA is an extensive revision over the previous model. Only the windscreen, roof dome, and door outer panels are carried over from the earlier generation vehicle. The gigantic grille at the front and fake fender vents gives a muscular appearance to the car. GM’s new Aveo U-Va back is dominated by the solid bumper and the round tail lamps in a clear-glass housing. New Aveo U-VA is powered by the same engine that powers the current one. The 8Valve, SOHC engine has a maximum torque of 110Nm at 4400rpm and a peak power of 76PS at 5500rpm. According to General Motors, this new Chevrolet Aveo U-VA would return 14-15kmpl in the city and 16-17kmpl in highway. 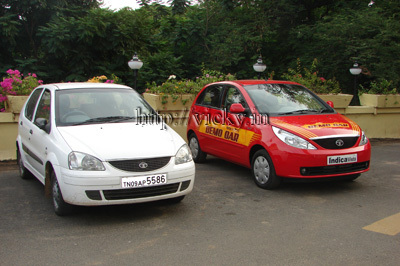 Similar to the older car, the new aveo U-VA also comes in three variants – 1.2,1.2LS and 1.2LT. New Aveo U-VA is also loaded with plenty of new features such as 14 inch alloy wheels on top end 1.2LT variant. The top end variant also gets larger profile 185/60 tyres, leather gear knob and rear spoiler. 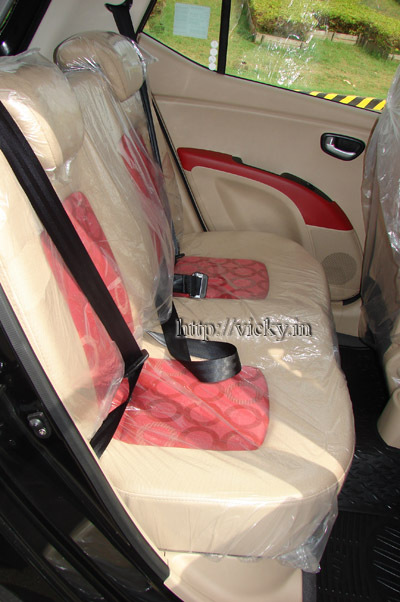 60:40 foldable rear seats is a standard feature in aveo U-Va 1.2LS and 1.2LT variants. All the three variants of the new aveo U-VA gets a digital clock. Mahindra Renault has launched a new series of logan with Driver Information System (DIS) which displays on-board fuel efficiency, average speed and mileage. The new series of logan will replace the current one and is priced Rs10,000 more than the current one. “We have added these features based on extensive customer feedback. The DIS system is available in luxury cars like Mercedes and BMWs, and Logan is the first car in its segment to get such a high-tech feature”MRPL CEO Nalin Mehta said. Mahindra Renault also kick started a pre-festive scheme of ‘Chaabi mein Gaadi’ under which the company will distribute keys to around eight lakh prospective customers across the country. The lucky contestant whose key turns on a Logan engine will drive away the car. When you look a much expected car in flesh, you always love to fly away with it. But sometimes we run ahead of time. Till a car exclusively for test drive is arranged, we are restricted to do only a smaller test drive. Unfortunately Tata Motors is yet to register an exclusive test drive car. We made a brief test drive of new Indica vista and here are our findings. When you pass-by the new Indica vista you might fail to notice this as a new one. Tata has carefully kept the same Indica family style. But take a close look you can feel why Tata engineers took so many months of time to bring this car to the market. The smile honeycomb grille is bounded swaparound petal shaped headlamps which is nicely placed on the lines of the bonnet. The headlamps has a small budge at the centre again a nice design touch. A slight central mid ridge on the bonnet is intended to give a V-shaped front but it resembles the styling of palio a product of Tata’s partner Fiat. Open the bonnet you could again seen the Fiat’s popular 1.3L multi jet engine which is coined as quadrajet. The c510 gearbox is also sourced from Fiat. But when the indica’s comfort and convenience combines with Fiat’s technology it could be lethal weapon against the likes of swift and i10. Though we cannot measure the fuel efficiency of the Indica vista.We are told that the mileage of the Indica vista in city is around 16kmpl and in highway it goes up to 20kmpl. Phenomenal isn’t it. The top speed is found to be over 140kmph and it feels solid even at those high speeds. But the tilt adjustable steering fails to gain weight proportional to the speed. A slight turn of the three spoke steering wheel at those high speeds would be detrimental. Another letdown is the absence of ABS and Airbags in the Indica vista. 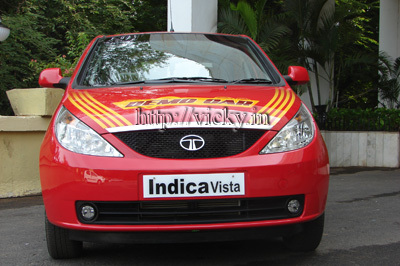 But the ride quality, comfort and convenience the Indica vista offers might earn applause even from a Tata critic. 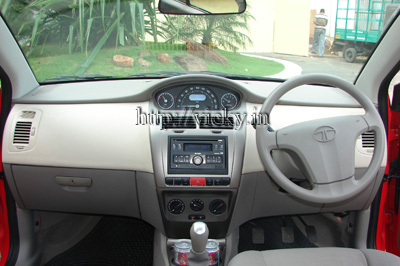 While the Indica v2 offered a raw space, the space is intelligently used in the new Indica vista. A glove box that can hold even a laptop, under deck space to hold water bottles,cubbyholes, wide door pockets and 60:40 foldable rear seats can give you the most comfortable journey that even a class above fails to offer. The front bucket seats are comfy, swaparound at some place to offer support ot every parts of your body. The driver seat is height adjustable but the ugly gear knob and large steering wheel might still make few fun loving guys away from the Indica vista. But this is our initial opinion, wait till our complete review for which we spend lotsa time with Indica vista to dig out more about the indica vista. Hyundai’s i10 is already a runaway success, but that hasn’t stopped the company introducing a new engine choice to make the city car even more competitive. Hyundai today launched the new i10 with the new 1.2L Kappa engine. The new Kappa engine pumps out 20% more power (now 80PS at 5200rpm) and the torque is improved by massive 13% to 114Nm. This figures should reflect in performance of the i10. 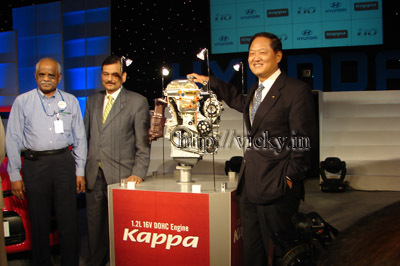 The new kappa engine is also said to be more fuel efficient. According to Hyundai the new i10 kappa should return 4-6% more mileage. 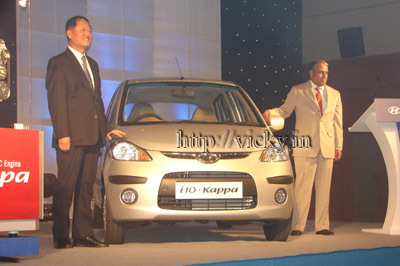 Along with the introduction of kappa powered i10, the much awaited automatic variant of i10 is also launched. The autobox is a four speed one. Hyundai has also introduced two new variants of i10 with the introduction of kappa powered i10. The two new variants are Asta and Sport. Magna variant of i10 will also get the kappa engine. 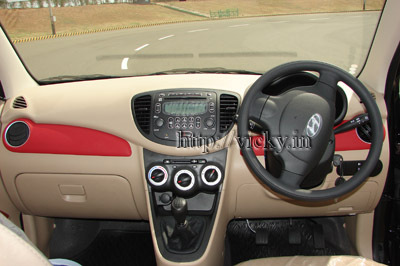 i10 Sportz gets an all new 2-Din audio system, a unique red pack for the Sportz interiors and some class leading safety features like anti-lock braking system (ABS) and dual airbags. While the i10 Asta gets top-end features like the sunroof, 2-Din audio system, and some class leading safety features like anti-lock braking system (ABS) and dual airbags.The price of the i10 variants starts from Rs3,99,000 and goes up to Rs5,42,754 (i10 Asta Automatic). Whether your dealer is making you frustrated? Has your dealer failed to keep the promise? Is your vehicle troubles you? Here’s the space to tear their mask and expose the true face? Share your problems/complaints with us and let other know your problems including the manufacturer and get it fixed. Before posting the comment please ensure that your complaints are genuine. it. please see, if anything is possible to do in this field. the name of mahindra.please take action about it. they can not promise.They said they have one with drum break and if I wish I pay extra. This seems to be third degree business trade that a street vendor does. I don’t know why your company is promoting business by forth grade. lead to give a hanky panky anwer. 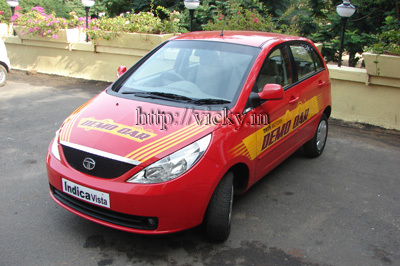 I can’t believe my ears when one of our close associates informed me that he got a chance to drive the Tata Nano. He and his team driven the car for few kilometers and following is the test drive report. Its incredible! but believe it, we driven the world’s most expected small car. Though its a brief drive, we are happy to share our experiences with you. We are happy that vicky.in readers gets the experience first before anyone in the world. We took the stunner of the Indian Auto Expo & Geneva Motor Show to the road. But unlike a regular test drive’s where journalist spent kilometers and kilometers with the car, we drove the Nano for not more than 3 kilometers. 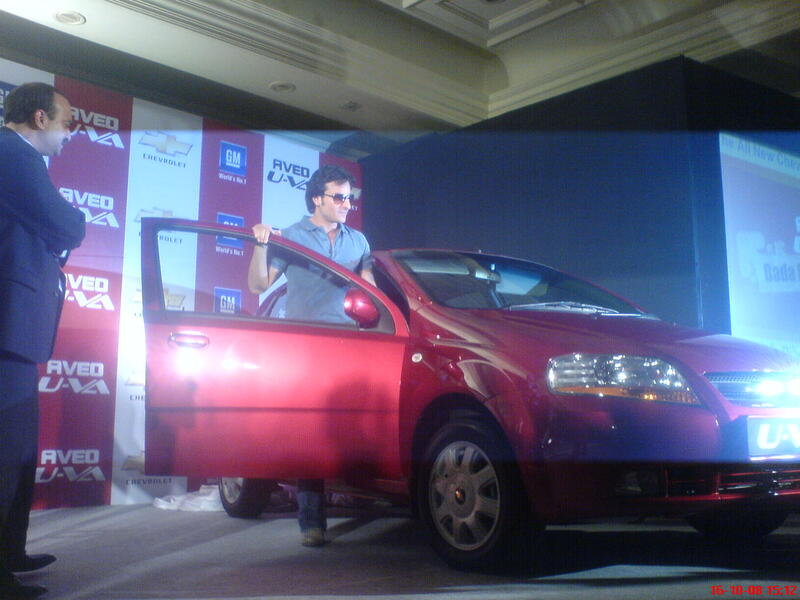 But test driving a Nano is so special and is definitely a memorable drive in our life. Let us proudly present you the world’s first test drive report on Tata’s Nano. Rather than frugal engineering i would prefer smart engineering. No one is going to accept if you are selling a ugly looking product. The cost cutting measures should not be felt by the end consumer. Cost cutting can be in the DNA but it should not be very apparent.When Tata announced its one lakh car project, I expected a car built on Tata Ace platform similar to Tata magic. I believed for the one lakh you can produce only a strip down version of Magic. But when i caught the glimpse of Tata Nano’s after so much nig-nag with the fellow press persons at the Delhi Auto expo. I was spellbound. I said to myself, Tata has done it! Nano is not a half car but a complete car and can be comparable to any other car you come across in the road. There are lot of cost cutting measures has gone into the car but all was not apparent. Nano is cute and it is eye pleasing. There are no cost-saving flat surfaces or flat plane glass on the Nano. When Girish wagh (the brain behind the Nano ) and his team came up with flat front similar to ace, Ratan Tata rejected the design and later Nano was designed with short overhang. Ultra short overhang not only brings the Nano a upmarket look but also improved its safety. Over the wedge shaped bonnet are the attractive headlamp clusters and in between them is the proud Tata badge. The design of the front bumper and fog lamp inserts makes the Nano like a toy car. The lines which starts from the headlamps flows smoothly over the length of the car. Large windshield ensures enough sunlight inside the car. The rear bumper which features a large airdam align with compact vents under the rear doors cools the engine. Stylish vents also increases the aesthetic factor of the nano. Similar to other Tata products Nano features vertical tail lamp cluster. Overall proportion of the Nano is attractive. Ratan Tata’s dream of convincing scooter and motorcycle buyers to buy Nano can be made real only if Nano is regular car with enough power under the hood. Nobody wants a car that is less than everybody else’s car. Tata has developed an engine on its own. While the a multi-point fuel injection system is developed by Bosch. The Value Motronic version o engine management system (EMS) supplied by Bosch is a stripped down version of popular Bosch’s Motronic system. Nano’s EMS uses only 300 of the Motronic’s 1,000 functions and employs only four sensors in order to reduce the cost. Tata has applied 10 patents for this engine alone. Let’s check out how this low cost performs on the road. An all-aluminium, twin cylinder 623cc, square mill which produces only 33bhp of maximum power powers the Nano. But contrary to our belief, it never felt underpowered. We were five fully grown adults yet Nano pulled without any struggle. It move past 60kmph without any strain but becomes noisy after that. Nano is fitted with four speed manual gearbox. The gearbox is far from the engine and is operated through cables. The gearbox is precise but it requires sufficient effort to slot in. As per the sticker mounted on the gear knob, Nano can be pushed to 30kmph in first gear,60kmph in second gear and 90kmph in third gear. The maximum speed is little upwards of 100kmph. The tall boy design and the rear engined layout are bane of the handling characteristics of the car. Nano combines the both so we cannot expect incredible in its handling.But honestly telling you Nano surpised us, before we tell you the Nano’s on road performance i wish to share the engineering gone into the car to offset the tail- heavy effect. Since the engine, clutch and final drive is located at the rear, the rear axle weighs more than the front. This weight has to be compensated and Porsche did this using advanced electronics and suspension systems. Tata cannot mirror Porsche technologies for Nano the same due to the 1 lakh constraint. Tata has adopted a new way, it has moved few aggregates such as the battery and spare wheel to the front and has adapted stiffer supension system. Nano is not a pure monocoque construction. The chassis features sub-frame and stiffening members for stability. 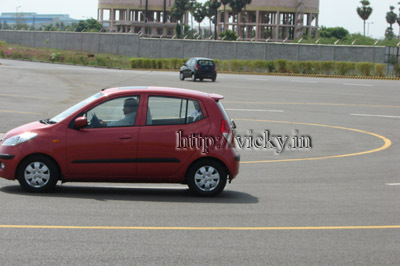 Similar to anyother RR car (rear engine, rear wheel driven car) Nano makes use of all independent suspension. Tata has tuned the McPherson strut in the front axle and makes use of larger tyres(155/65) at the rear to increase the stability. We put the Nano in a test track where cones are placed apart at a fixed distance (the test where cars zig-zag between cones is called a moose test.) Nano was loaded with five adults and we started swiveling the car between the cones. The body roll is minimal and we never felt nervous even while swiveling the Nano at moderate speeds. But under hard braking Nano tends to oversteer. Nano makes use of drum brakes on all wheels. The test drive track is flat which means we cannot comment anything on the ride quality of the Nano. 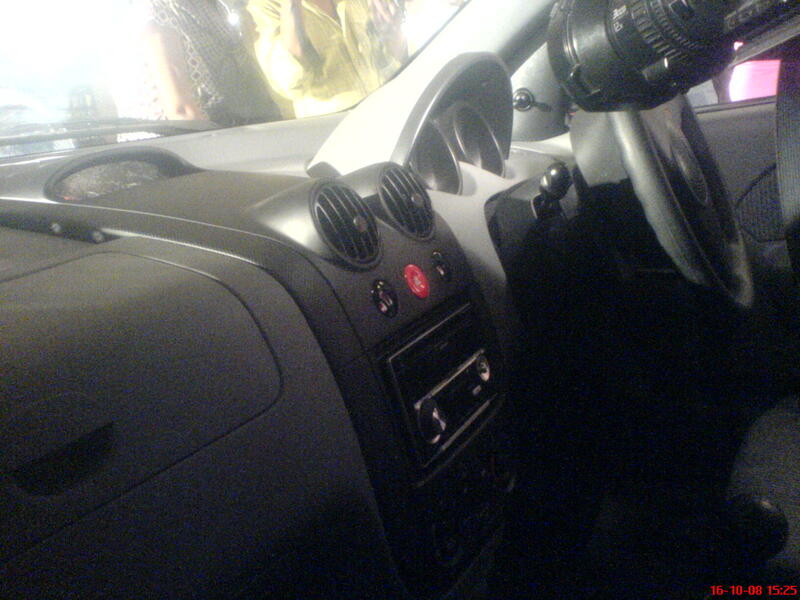 The nano variant we put into test drive comes with power windows but there is not power steering. The steering wheel is small and uncomfortable to hold yet Nano negotiates corners at ease. Hence parking and moving in the tight traffic won’t be an issue. Credits to the Nano’s length. The ultra compact car is only 3.1 metres in length. But the tall roofline ensures enough space even for tall riders and getting into the driver’s seat is not a muscle burning exercise. Also since the wheels are pushed to the edges there a plenty of raw space inside the Nano. Similar to Indica, Nano’s selling point is going to be its spaciousness. Even a fat guy can sit leisurely in the co-passenger seat. In-built headrests similar to what we found in Hyundai’s i10 for the front seats offers good support. The cabin is roomy and bright becuase of the large windshied. Quarter glass are nice addition but the ear view mirror is too small. Because of the rear engine, rear wheel drive layout the floor is almost flat and even the middle passenger can sit comfortably. The seats are firm and offers good support. Nano can host three adults comfortably in the rear seat. As the instrument cluster is moved to centre of the dashboard it frees lots of space. On both the sides of the dash are the nicely carved out storage areas. But the real motive behind this centrally mounted instrument console not in front of the driver is the same dashboard can be used for a left-hand-drive vehicle. Similar handles and mechanisms are used for the left- and right-side doors to reduce cost. There are a lot of such innovations that are low-cost and future-oriented. But the exposed pillars,poor quality plastics and smaller control knobs reminds you the price. There are no rubber mounts on the pedal in our test drive. The rear of the car is welded and access to the motor is only from inside. Fuel filler is under the bonnet. NVH (Noise,Volatile Vibration and Harshness) has never been better with Indian cars. Since it increases the cost significantly, Indian manufactuers bound to spend little on controlling NVH. Being a one lakh car we were not expecting anything big from Nano. But it produces more noise. To be frank, it’s no different from the regular autorickshaw, the noise level is too high. Get inside the Nano, rise the windows you can still hear the noise. Espescially the rear passengers sitting close to the engine can hear more noise. We pray for better insulation in the actual production model. We cannot comment anything on Nano’s mileage with the 3km short drive. We don’t want to make any conclusion and but we wish this Nano a grand success. Maruti today unveiled the sedan variant of swift called Swift DZiRE. Maruti started the swift Dzire project in 2005 and is a planned progression of the Swift hatchback. Maruti has invested over Rs30crores for making swift dzire. “The image of a hatchback and styling of Swift is carried forward to the Sedan. The new car will be available in both petrol and diesel variants,” Maruti Suzuki India Ltd Executive Officer (Marketing and Sales) Mayank Pareek said. On the pricing of the new car, Pareek declined to share details. However according to the company sources, the petrol variant is expected to be priced between Rs 4.75 to Rs 5 lakh, while the diesel variant would be available for above Rs 5.5 lakh. Swift Dzire will be launched on March 29th. The new red logo is here! Yes, Fiat has rolled out its first car in India with the new red logo. The new red logo symbolizes the Fiat of modern age. 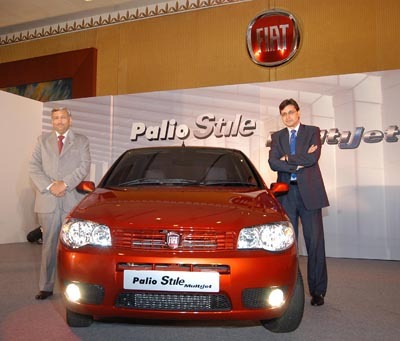 Fiat which is trying hard to make a comeback into the Indian market has launched a diesel version of Palio stile. Launch of the Palio Stile multijet diesel version is first in the line of many exciting launches such as linea and punto lined up by Fiat through this year. Palio stile which was launched in 2007 is currently available in 2 petrol versions – 1.1L and 1.6L Sport. The new Palio stile diesel is one of the most expected machines in 2008 as it is powered by popular 1.3L multijet diesel engine. Fiat, General Motors and Suzuki developed this diesel engine jointly and this engine has won many awards across the globe. We Indians know this engine as DDIS, yes, it is already doing the duty in Maruti Suzuki’s swift. This same 1.3L engine will power the Tata’s new Indica and General Motors new small car. Under the hood of the new palio stile diesel, the 1.3l engine produces a maximum power of 75 PS at 4000 rpm and a peak torque of 184 Nm at 2000rpm. These figures are almost the same as the Swift diesel. Fiat uses the same gearbox used in 1.9L palio diesel to derive power from this 1.3l Multijet diesel. In addition to the new engine, Fiat palio stile diesel also gets plush new interiors, an attractive new front grills and attractive colours. The Palio Stile Multijet diesel will be available in 5 exciting colors – Furnace red, Magnesium grey, Ozone blue, Mint White and Carbon black, across 3 versions – SD, SDE & SDX. But the key factor which may lure hatchback buyer is the aggressive price tag. Fiat has priced the new Palio stile diesel very competitively. Palio Stile diesel base variant (SD) is priced Rs4,37,960, the mid SDE variant is priced Rs4,57,962 and top end SDX is priced Rs4,77,968. Fiat which sells 2500 units of palio diesel annually hopes to sell 6000 units of the car with the launch of new Palio stile diesel. Fiat’s palio stile diesel will compete Maruti Suzuki’s swift and the new Skoda Fabia. It seems that Fiat is finally has a winner on its hands, but wait till our test drive. Ford has launched a new Fusion plus today. 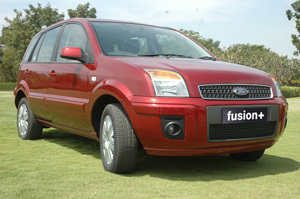 The facelifted fusion plus comes with a lot of new features. According to Ford, the new Fusion plus was developed in response to consumer feedback, and their desire for a Fusion with additional features and distinctive styling. The Fusion Plus has an all-new anti-lock braking system (ABS) and carries additional features such as 15-inch alloy wheels, body coloured outside rear view mirrors, body-colour bumpers, door handles, side moulding and deck lid. The new top end variant of Fusion+ also gets a special badge. The new Fusion+ comes at an attractive price of Rs.6,16,500 – DuraTec petrol and Rs.6,83,500 Duratorq diesel (Ex-showroom, Chennai). The introductory offer on the Fusion Plus this month (March) includes a MP3 player with 4 speakers, making it even more attractive.